The food hygiene rating reflects the hygiene standards found at the time any given business is inspected by a food safety officer. These officers are specially trained to assess food hygiene standards. A business can be given one of these ratings. The top level of food hygiene rating is a ‘5’. This means that the premises are rated as very good. A food safety officer inspects a business to check that it meets the requirements of food hygiene legislation and he or she is from the local authority where the business is located. How hygienically the food is handled, how it is prepared, cooked, re-heated, cooled and stored. and how the business manages what it does to make sure food is safe so that the officer can be confident that standards will be maintained in the future. Each of these three elements is essential for making sure that food hygiene standards meet the requirements and the food served or sold to you is safe to eat. 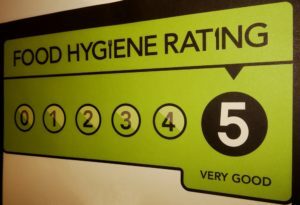 If the top rating is not given, the officer will explain to the person who owns or manages the business what improvements need to be made and what action they can take to improve their hygiene rating. The rating given shows how well the business is doing overall but also takes account of the element or elements most in need of improvement and also the level of risk to people’s health that these issues pose. This is because some businesses will do well in some areas and less well in others, but each of these elements checked is essential for making sure that food hygiene standards meet requirements and the food served or sold to you is safe to eat. To get the top rating of ‘5’, businesses must do well in all three elements. Those with ratings of ‘0’ are very likely to be performing poorly in all three elements and are likely to have a history of serious problems. There may, for example, be a lack of sufficient cleaning and disinfection, and there may not be a good enough system of management in place to check and record what the business does to make sure the food is safe. Businesses will be given a sticker or certificate showing their rating. They can then choose to display this in a prominent position to show customers how good hygiene standards are. Customers will also be able to clarify these ratings on the Food Standards Agency’s website at food.gov.uk/ratings. Food safety training can be taken online on our Food Safety course or why not try our diet and nutrition course. © Copyright ProTrainings Europe Ltd.